Fueled by economic anxiety and unhappiness with Democratic stewardship of the country, an older and much more conservative electorate than in 2006 and 2008 propelled the Republican Party to a broad victory in yesterday’s elections. 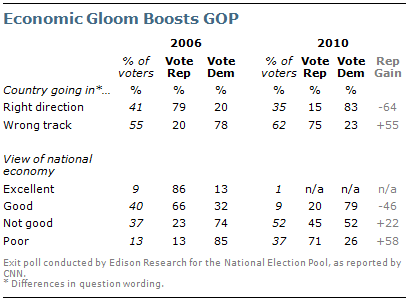 As pre-election surveys had predicted, the Republican Party enjoyed a wide enthusiasm gap. Conservatives and older voters made up a much greater share of the electorate than they did in 2006; and more voters opposed activist government than did so two years ago. These groups all voted for Republicans by wide margins, according to exit polls by the National Election Pool, as reported by CNN. The proportion of self-described conservative voters increased by nearly a third from 2006 — from 32% to 42% — and is the highest percentage of conservative voters in the past two decades. However, the single biggest factor in the GOP’s victories was its striking gain among political independents. By 56% to 37%, more independents voted for the Republican candidate this year; four years ago, independents favored the Democrat by nearly an identical margin (57% to 39%). And just two years ago, Barack Obama won the votes of independents (by 52% to 44%) on his way to the White House. Despite the Republicans’ sizable gains among virtually all demographic groups — with the exceptions of African Americans and young people — voters express a negative view of the party. The outcome of this year’s election represented a repudiation of the political status quo, rather than a vote of confidence in the GOP or a statement of support for its policies. 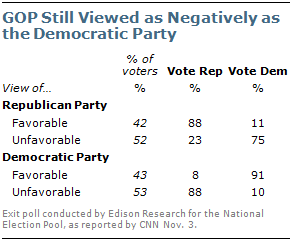 By 53% to 41%, more voters expressed an unfavorable opinion than a favorable opinion of the GOP. Indeed, views of Republican Party are no more positive than those of the Democratic Party (52% unfavorable vs. 44% favorable), which was roundly defeated. Voters expressed great unhappiness with national conditions and with the performance of the federal government. Half (49%) said they were very worried about economic conditions and another 37% were somewhat worried; most (61%) said the country was on the wrong track. Fully 73% said they were either angry or dissatisfied with the federal government, and 73% disapproved of the job Congress is doing. As was the case in 2006, an overwhelming percentage of those who said the country was on the wrong track voted for the party out of power — 76% supported Republican candidates in Tuesday’s elections. But there is greater dissatisfaction now than there was four years ago. Similarly, views of national economic conditions are far more negative — with nearly triple the percentage rating conditions as poor than did so in 2006; those voters voted Republican this year, by 68% to 28%. Voters registered their opposition to a more activist federal government: fully 56% said government is doing too much better left to businesses and individuals, while 38% said the government should do more to solve problems. In June, opinion on this issue among the general public was more narrowly divided — 47% said the government was doing too much while 43% said it should do more. And two years ago, when Obama was elected, more said the government should do more to solve problems than disagreed (by 51% to 43%). Yet while a majority of voters favor a smaller government, there was far less agreement about congressional priorities or the policy proposals before Congress. Four-in-ten (40%) said that reducing the deficit should be the highest priority for the next Congress while nearly as many said spending to create jobs (37%). 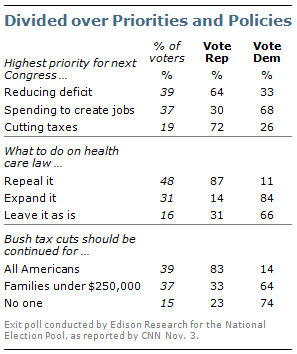 And while fewer voters (18%) rated cutting taxes as the highest priority, more Republican voters viewed tax cuts as the top priority than cited reducing the deficit (71% vs. 65%). Similarly, voters were divided over whether to repeal health care reform (48%) or maintain or even expand it (16% leave as is, 31% expand). And there was no agreement on what to do about the Bush-era tax cuts. About as many favored extending them only for families with incomes under $250,000 (36%) as favored extending them for all Americans (40%); 15% said they should not be extended for anyone. A sizeable number of voters (41%) said that they support the Tea Party political movement (including 21% who strongly support it). Fewer (30%) said they oppose the movement (23% strongly); another 24% said they neither support nor oppose it. Agreement with the Tea Party was considerably higher than in most pre-election polling, reflecting the greater enthusiasm of conservative voters to turn out. Tea Party supporters overwhelmingly supported Republican candidates for the House nationally, and in key Senate races such as Nevada. Those who support the Tea Party voted 86% to 11% for Republican House candidates, while those who oppose the movement voted 86% to 12% for Democratic candidates. 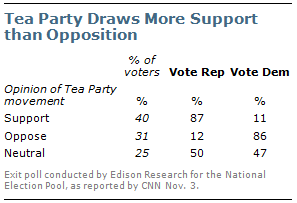 Those who are neutral about the Tea Party divided their votes about evenly (50% Republican, 47% Democratic). But fewer voters (22%) said their vote for the House was meant to send a message in favor of the Tea Party; nearly as many (17%) said they were casting a vote against the Tea Party, while a majority (57%) said the Tea Party was not a factor in their vote. 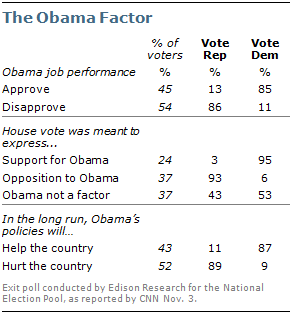 Opinion of President Obama was negative factor for Democratic candidates yesterday. By a 55%-to-44% margin, voters expressed disapproval of his job performance, and 52% said they thought the president’s policies would hurt the country in the long run. On balance more voters said they were casting a ballot to express opposition to him (38%), than to voice support for him (23%), while 38% said Obama was not a factor in their vote. An exit poll analysis of the Latino vote from the Pew Hispanic Center. An exit poll analysis of the vote by religious groups from Pew Research Center’s Forum on Religion & Public Life. *The vote share results shown in this report reflect a revised weighting of the National Election Pool’s national exit poll on Nov. 9, 2010 . The reweighting resulted in small changes in the Republican vs. Democratic share of the U.S. House vote.